Oil Fired Unit Heaters -These Flexiheat range of oil fired unit heaters are indirect oil fired suspended warm air unit heaters, which have been designed for use in factory or warehouse premises where floor space is at a premium,particularly in areas where supplies of other fuel sources , such as natural gas or LPG gas, may be undependable , uninterruptible or unavailable. The main advantages of these oil fired unit heaters is the space-saving suspended installation with efficiency, energy saving, comfort and reliability in a compact design that is specially designed for indoor areas that are tight for space. The units suspended from the ceiling – ensuring the entire area under the appliance can be used. 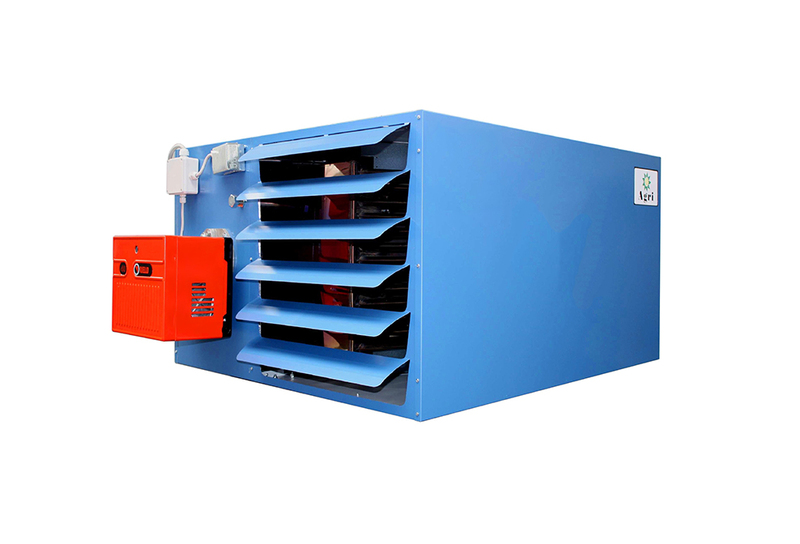 The first range is our FHOUH range of Oil Unit Heaters, which can be room sealed, taking the combustion air from outside to the building, and expelling the exhaust gases ,(or often referred to as the products of combustion) externally. The new stainless steel combustion chamber is able to guarantee high efficiency and reduced load losses. The dimensions of the heater have been reduced and it doesn’t require a lot of space. Thanks to its new design it is suitable for all the kinds of heating applications. 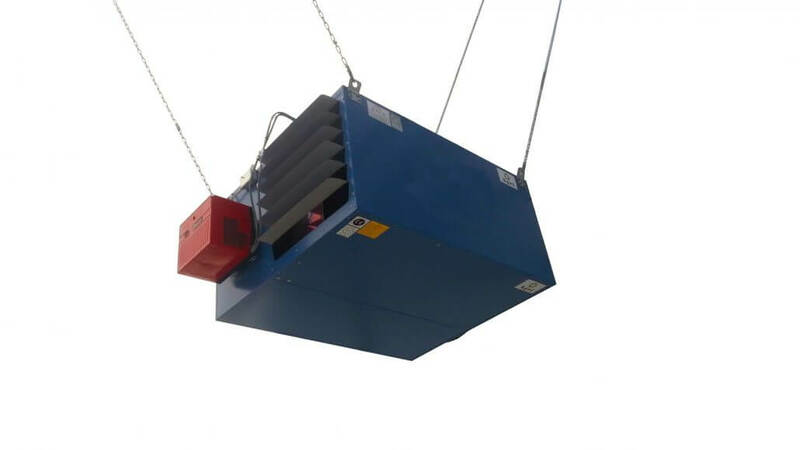 The air heater is CE certificated for type C installation(external air intake and fume exhaust with airtight connections). 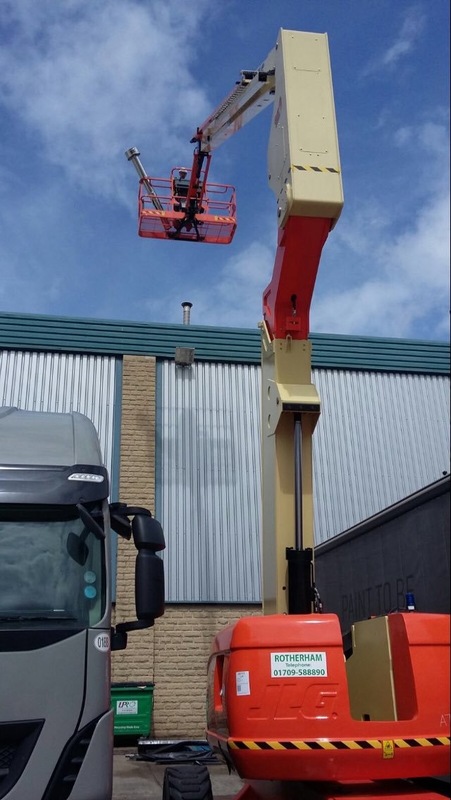 Because this range of oil unit heaters can have the flue pipes or chimney exiting the building horizontally , this make them very easy to install , as well as cheaper , as no cranes , lift etc are required to install the flue pipe , especially when the units are installed at low level / ground level – not to mention the health and safety requirements at working at heights are eliminated – So no more of this – and the expense and health and safety associated with it. These warm air heaters can be used in either a free blowing or flexible ducting air distribution, working with a light oil burner. 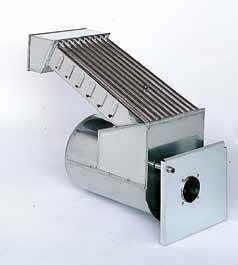 The stainless steel combustion chamber and heat exchanger are constructed in stainless steel AISI 430, either with high performance axial or centrifugal fans, electronic control and safety system.These oil unit heaters are robustly constructed ,manufactured by galvanized pre-coated steel panels fitted with radiant sheet insulation. The range of 5 models have been designed for : warehouse heating, greenhouses heating, factory heating ,workshop heating or basically any where you would like to use oil as your heating fuel, and keep the heater off the floor . A huge range of accessories is available for heater range.Another great benefit of this heater range , is that they can be flued horizontal , for a maximum of 3 metres , which often saves in the time and hassle factor , as opposed to flueing these oil fired unit heaters vertically through a roof. 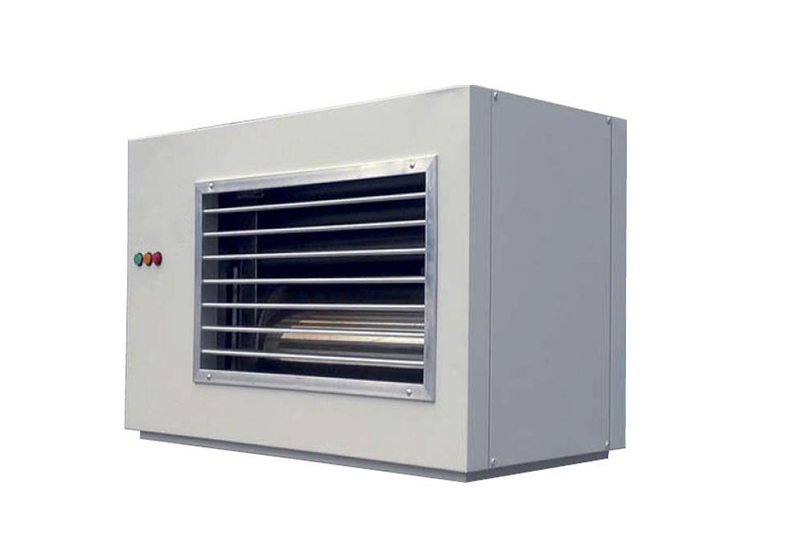 The Flexiheat oil unit heaters can be supplied in axial fan free blowing format, to be installed directly into the space to be heated, or with centrifugal fan for ducted applications. 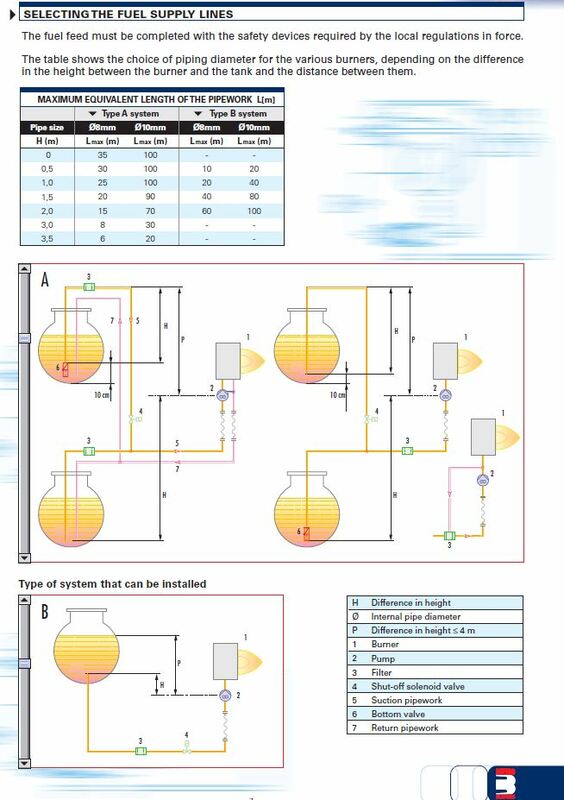 Heaters are generally arranged for on/off operation. With our patented highest efficiency heat exchanger, with air flow completely in counter current to the exhaust flow, made exclusively in 18% chromium stainless steel, which guarantees total protection against corrosion, both from humidity and combustion by-products. 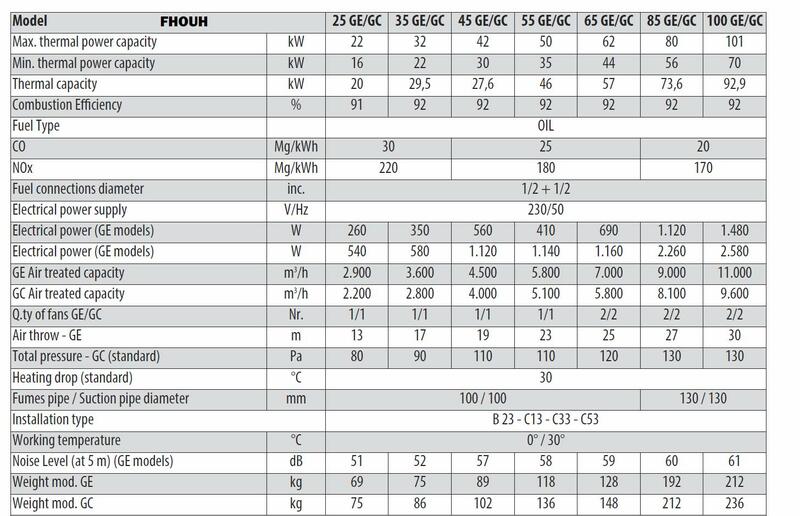 – Exchange elements, inclined upwards, with flat tubular section exhaust flues and with swirl impressions for maximum thermal efficiency. – Exhaust manifold with wide inspection door for easy cleaning of the exchanger and chimney inlet. Free blowing models are fitted with axial fan sets and discharge warmed air directly into the heated space via adjustable louvered horizontal grilles. Centrifugal fan models are fitted with a centrifugal fan close-coupled directly to the heater casing.The burner , along with the fan and high limit stat, are externally mounted, giving good and easy access to them when servicing the unit.The stainless steel combustion chamber and heat exchanger , which are guaranteed for 10 years gives you a reliable and long life heater. The range has been designed for use in factory or warehouse premises where oil fired heating is a requirement and floor space is at a premium. 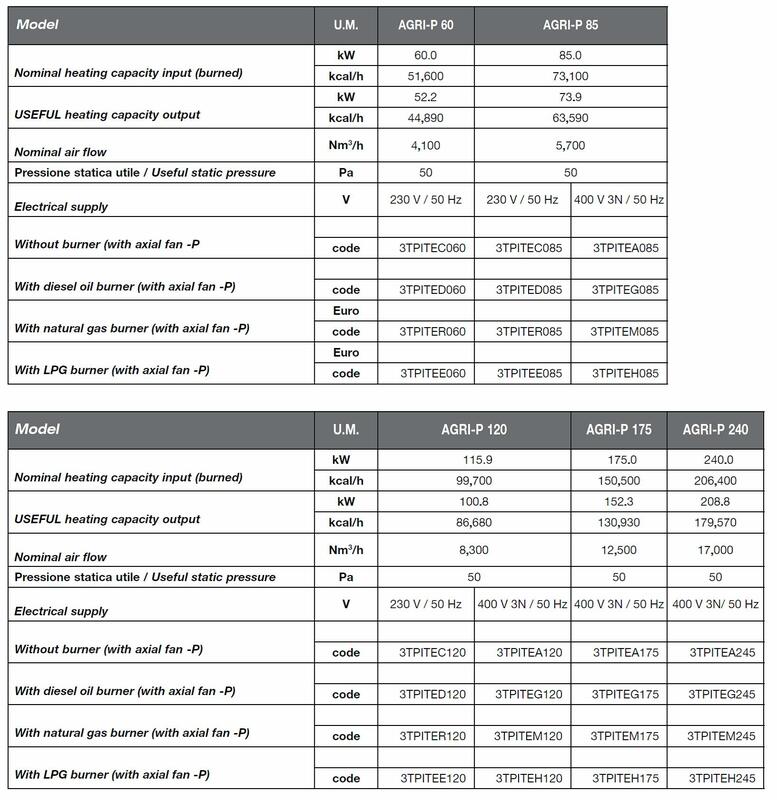 Should you require anymore assistance or information on our oil fired unit heaters / Suspended oil heaters ,please don’t hesitate to contact our sales team on 01202 822221 or click here for our email contact form, please note we can also supply these heaters with either natural gas or a propane gas burner if so required.